Do you like to invest in Share Market? Here is complete Portfolio of Rakesh Jhunjhunwala. Do you know who Rakesh Jhunjhunwala is? He is the famous and most characteristic investor of India. He is popular and respected equity investors of India. You should read more interesting fun facts about him. Here are they. Rakesh Jhunjhunwala is the most successful Indian equity investor who manages to invest in various stocks. He manages his portfolio as a partner in his benefit management firm named as “Rare Enterprises”. He is a son of an income tax officer and he begun to trade in stocks when he was studying in Sydehham College. He got pushed into the investing profession after completion of his education. Here is an updates Rakesh Jhunjhunwala portfolio of October 2015 that you must see once. As you can see in this portfolio table of Rakesh Jhunjhunwala, he has invested in 41 major companies. His total portfolio amount is above 6239 crore. He owns 804.66 lakhs shares of Titan Company with the value of 1,799 crores. At the second number, he owns 78.83 lakhs shares having a value of 737 crores. He also owns shares of the leading companies such as NCC, Escorts, TV18 broadcast, Spicejet, Hindustan Oil Exploration Company, and many more. Recently, in 2014 he bought the shares of DHFL (25 lakh shares), Radico Khaitan (685,112 shares), HT Media (15 lakh shares), Endelweiss Capital (1 crore shares), MCX (5 lakh shares), and Prakash Industries (2500000 shares). He also stated that he likes to follow the shares of Nagarjuna, Tata Motors, HPCL, BPCL, DHFL, and Escorts. In this running year 2015, he bought 30 lakh shares of Man Infra at the cost of 36 Rs per share on 30th January 2015. Moreover, he also bought additional 12.5 lakh shares in Delta Corp at the cost of 91.75 Rs per share. 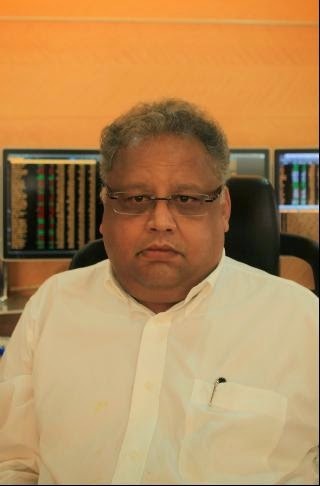 Rakesh Jhunjhunwala’s top 7 favorite stocks on which he is betting includes Titan Company, Lupin, MCX, Crisil, Rallis India, and United Spirits. He also likes to invest in the housing finance companies. His portfolio is very interesting and inspiring. He made his vision very successful with the net worth of more than 1 billion US dollars. Isn’t it amazing! Keep Visiting Us, We Will Keep Updating this page with Rakesh Jhunjhunwala Portfolio. Follow his Profile At Moneycontrol.com.